Over 500 international graduate recruits were thrown in at the deep end to manage routine operations of an established bank over four years. 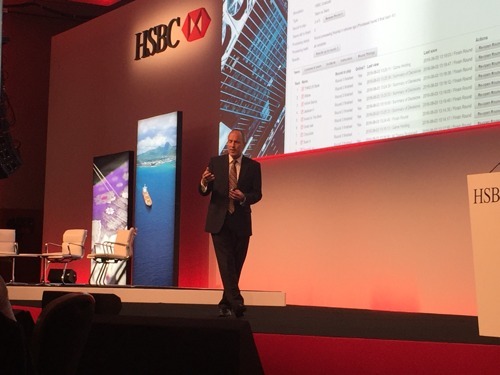 Teams had to respond to six challenges devised by HSBC to reflect challenges they will face when they start work in the real business. Experiential learning gained while doing in the simulation will provide a solid base from which to start their careers in banking. The scope of the decisions required and the time pressure of the day meant that effective teams needed to divide the labour and co-ordinate efforts to produce a good overall result. Yearly results from the teams' simulated banks were available within minutes allowing the facilitator to compare decisions, present relative performance of the teams and diagnose the reasons for specific outcomes in individual teams. Comparing the teams' responses to the real-world challenges led into feedback about the consequences of their decisions. Teams used the provided iPads to access the simulation and enter their decisions, with some using their own mobile devices to augment the online and printed material. Feedback from the graduates indicated that a day of intense practical activity provided a welcome balance to the coaching approach of the other days.